Video: Victoria Day Outdoor Chanting (Harinama) ~ The Toronto Hare Krishna Temple! On Monday, May 23rd, most of Toronto was celebrating a day off, marking Victoria Day. 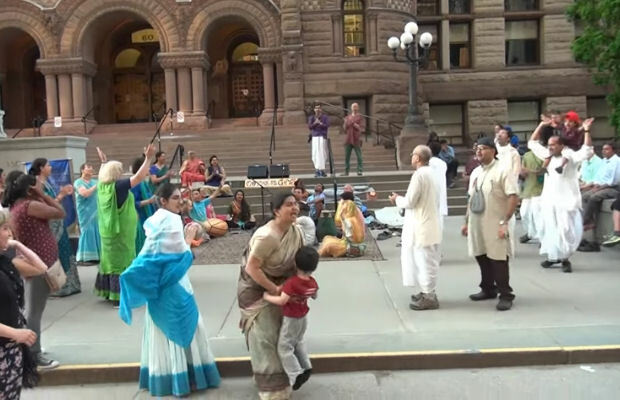 Meanwhile, enthusiastic members of the Toronto Hare Krishna community hit the streets with instruments, smiles and books to share an uplifting, spiritual message through harinama sankirtan (outdoor chanting and dancing)! Led by Vaisesika Prabhu and Nirakula Mataji, the devotees setup at Bay & Queen and brought smiles to people's faces for several hours! Check out the last 15 minutes of the harinama, which were captured by our dear Sathi Prabhu.